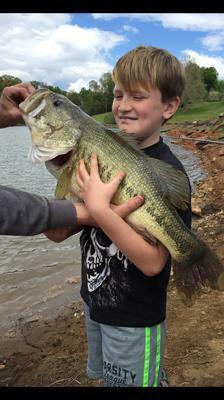 My 7 year old son caught a fish of a lifetime. So proud of Brock. Wow! What an awesome fish, Brock! I agree, that is a fish of a lifetime. There are many people that will spend their entire lives fishing and may never get lucky enough to hook into and catch a largemouth bass that big. But I have a feeling that you might be catching more beasts like that in the future. Join in and write your own page! It's easy to do. How? Simply click here to return to Bass Fishing Pictures.